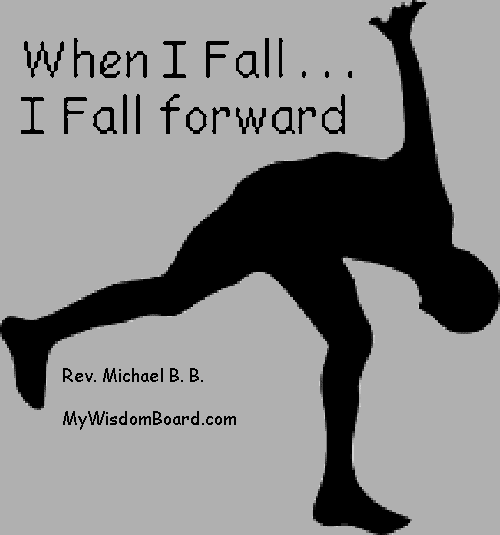 My Wisdom Board Blog : When I Fall . . . When I Fall . . .
. . . and then I get back up ! I am a powerful Spiritual Being ! Spirit walks with me – Always. I Trust ! I have Faith ! I Listen and I Learn ! I Love and I Congratulate myself for the work I am already doing ! I am loved and supported . . . ALWAYS ! I know . . . Everything is working together for my Good ! I know . . . Everything is as it should be for where I am and my level of awareness. I see that . . . I’ve come a long way . . . and that I have good reason to feel proud of myself ! My needs are met . . . I Trust - All will be well ! Everything is Always working out for my Highest Good ! I Allow the pain . . . I allow myself to feel it . . . but I don’t feed it ! I Allow it to Flow through me and out of my body. I take my attention away from the pain and . . . I Distract myself. I shift my thinking . . . my self-talk. I give my attention to the Potential . . . to the Possibilities ! I embrace and feed thoughts of the Potential and I nurture the Possibilities. I Feel deep Appreciation for the Possibilities. I allow the thoughts of the Possibilities to expand . . . and I bask in feeling of my Wishes fulfilled !